Luton boss Nathan Jones admitted there was an element of relief in his side getting off the mark in League One with a 2-0 win over Southend United at Kenilworth Road yesterday. 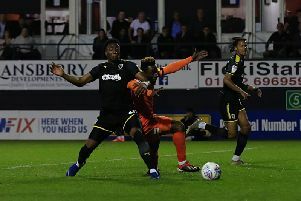 The Hatters had failed to win any of their three opening fixtures, albeit against sides who are heavily tipped for promotion, plus being knocked out of the Carabao Cup at former Premier League side West Bromwich Albion too. However, goals from Elliot Lee and Danny Hylton ensured Town had their first three points as Jones said: “I won’t lie, it’s not like phew, but it’s nice as our performances have merited more. “Our Portsmouth performances merited a lot more and you’ve see they’ve won four on the spin, they got out of jail in our game, but probably deserved their wins since then. “We’ve had a tough start, we’ve had a real tough start. Then to go to West Brom in midweek, who narrowly beat us 1-0 and then put seven past QPR, it shows we’re in a good place, we really are. “We’ve got great fans here who back us, as they could think, one point out of nine, so it could have been different. “But two tough away games, we’ve played Sunderland and West Brom as well, it’s the toughest start that any League One side could have had. “I think we’ve acquitted ourselves very well and bear in mind, we’re a new side coming up, so we’ve had to find our feet, the tempo the pace. “It’s different from League Two, so we’re finding our feet and we will. The margin of victory might have been even greater had Hylton and Andrew Shinnie finished on chances when clean through, although Jones was satisfied with the outcome. He continued: “It could have been more, on the counter attack we had some wonderful opportunities and we should have killed the game off a lot sooner. "But if someone had said, you're going to come up against Southend, keep a clean sheet, you're going to score two and say that we should have won by more, then I would have taken that as these are a very good side. “We’ve watched them in the build up to the game, so we knew we were in for a tough game. “We had to defend our box fantastically well, which we did, we showed a real cutting edge, which we did. The fact that Lee got his goal so early on, netting from close range inside just 90 seconds was the perfect beginning for Jones, who had seen his side ship three during the first half at Peterborough on Saturday. He added: “We needed that, we worked on a good start, not to be slow, but come out of the traps early and get a real foothold in the game. "Tonight was about building into the game, as we’ve been totally dominant against Portsmouth, conceded a goal which allowed them to cling on. “Now we didn't want that, the same with Sunderland, they scored first, we had to chase the game, we didn’t want that. “When sides come out, you've seen what can happen, so that’s what we did better. “We built into the game, kept a clean sheet, got the first goal, brilliant to get it so early and then we went on from there. “We’ve had three real, real good chances, Elliot Lee’s cut inside and the keeper’s made a save, we’ve had a lot of chances second half on the counter. “But that’s what happens when you keep a clean sheet, when you build into the game, when you put a defensive foundation in, sides will have to come out, that’s when you can hurt teams and that’s what we did.